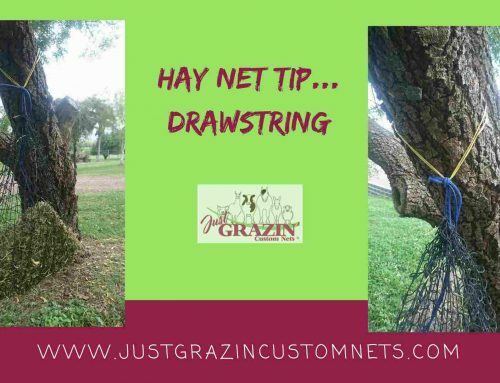 The following comment was posted in an online forum, so I thought we’d offer some tips on using slow feed hay nets. “I once tried a slow feed hay net, but my horse starved”. It’s important when introducing slow feed hay nets to your horse, that it is done correctly. You will need to provide loose hay while your horse gets used to the net. 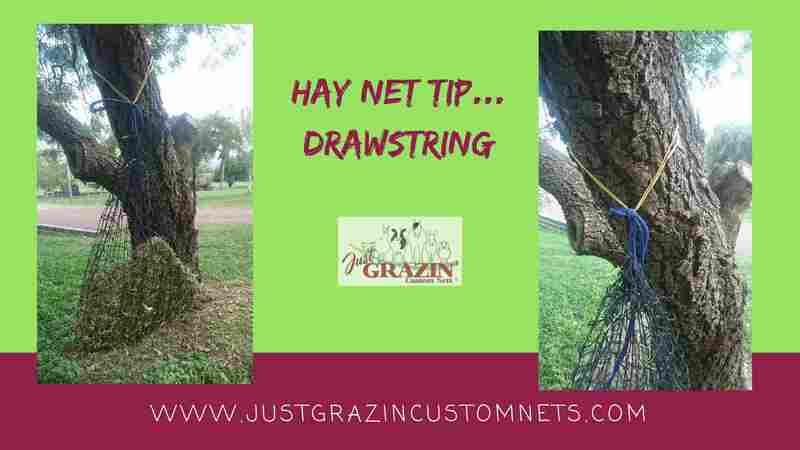 This gives your horse time to explore the net and work out how to graze from it. Hungry horses may become frustrated when learning and quit trying to get the hay from the nets. If after some time you find your horse is still having trouble using the slow feed hay nets, you may need to go to a larger hole size. 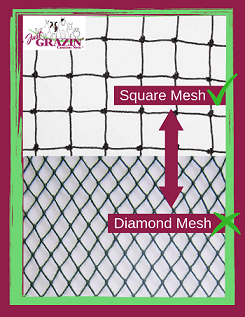 Just Grazin Custom Nets® have the traditional slow feeding 4 x 4 cm size netting, along with the larger 6 x 6 cm netting. We also offer the smaller 3 x 3 cm. 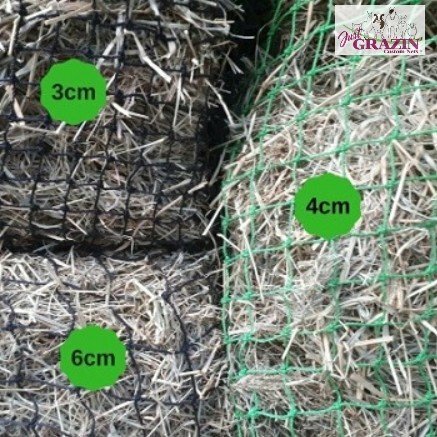 3 cm is suitable for mini’s, ponies and horses who are experts at grazin’ from the slow feed hay nets. Feedback we received from a customer who purchased a 4cm net – at first her horse got frustrated and would always put a hole in the net. She fixed it, but he’d do it again. The horse was basically making his own 6cm net. She tried him with a 6cm net, the frustration stopped and so did the holes. After several months using the 6cm net she tried him with the 4cm again. He accepted it this time, without frustration and without trying to wreck the net. 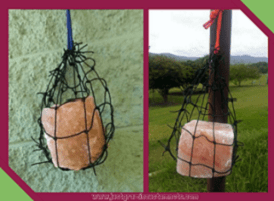 3 x 3 cm Netting…..
Is your horse a pro at using a slow feeder? 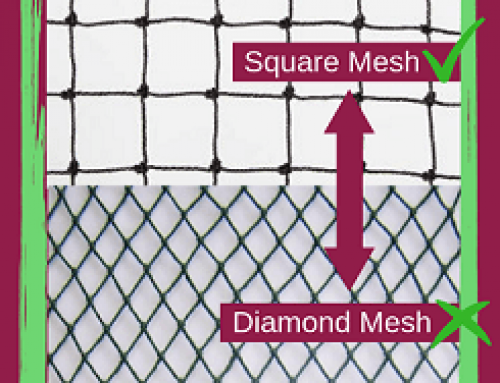 Do you find the traditional 4 cm netting is not quite small enough? Do you have laminitic ponies, own mini’s or feed out top quality leafy hay? 3 cm x 3 cm netting is recommended for animals who are experienced with using slow feed hay nets, or for use with mini’s, goats, sheep etc. Best used with high quality leafy hay, the type of hay your horse/animals usually eat FAST. Some horses may be frustrated by this size netting, especially if they aren’t conditioned to using a slow feed hay net. Others are happy to graze from the net straight away. Our 3 cm netting range is available in 48 ply netting, colour is black. 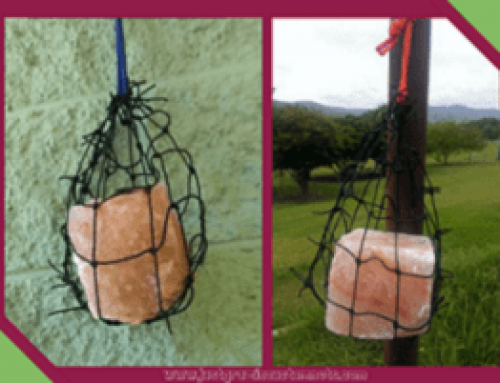 4 x 4 cm Netting…..
Are you looking for a hay net to slow down consumption? Do you feed good quality hay and want to reduce the waste? 4 cm x 4 cm netting is the traditional size netting and most common used for slow feeding hay. 4 cm is our most popular size, is a good general purpose netting and suitable for the majority of hay types. 4 cm netting will reduce hay waste as well as slow consumption. All of our 4 cm nets are made with a robust 60 ply netting, green in colour. 6 x 6 cm Netting…..
Sick and tired of your hay being spread around and wasted? 6 cm x 6 cm netting is ideal for those who mainly want to stop their horses wasting so much hay. 6 cm netting does slow consumption to a degree, but not as much as 3 or 4 cm netting. Suited to all types of hay including hay of lower quality & cereal hays. 6 cm netting is also a great choice for older retired horses, or horses who dont need their hay restricted, but you want to save $ on waste. ​NOTE: Prior to use, be sure your horses/animals hooves are larger than the size of the netting. 6cm netting is not recommended for foals or mini’s due to their small feet. If using with small footed animals, be sure their feet cannot access the net, as they may become tangled/injured. Shod horse’s hoofs should not be allowed to come into contact with the net. Please read our FAQ’s (or the instructions included with your net) for ideas on using slow feed hay nets with shod/small footed animals.